Imagine this: A small rod is shown to have six different colored spots on each side. A spectator selects a color and magically all the spots vanish - except for the selected color! That is the Zeezo Hot Rod, a classic pocket trick with a clever new twist! Armed with a Zeezo Hot Rod you can perform an entertaining routine for your audience anytime. The step-by-step instructions included will give you all the tips and tricks for performing with your Zeezo Hot Rod. 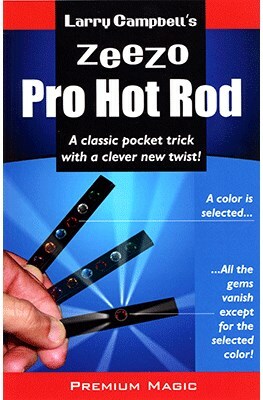 The Zeezo Hot Rod is a clever twist on the classic Hot Rod effect and was created by master magician Larry Campbell. It is manufactured with his kind permission.